My cell phone warbled at me to let me know I had a new message. I slid it open to read a text from my neighbor Barb: "did your dogs steal my dead possum?" I had heard a shot last night. I stiffened in my chair, then thought "oh, it must be Ralph. I wonder what he got." Well, within seconds Barb called me to let me know that it WAS Ralph shooting a possum that their German Shepherd had found and, well, it needed to be put out of its misery. Hope had used it for a chewie toy. I really wasn't all that bothered by it, just glad to have the vermin population around here reduced by one. I can't believe city folk can be so . . .well, DUMB. See, I know firsthand what dead possum smells like. Not only did we trap and kill one by my coop this last fall, I even had an experience when we lived in the city. On my way to work one chilly, drizzly day, I let our dogs out into our backyard. When I came home, I decided to make taco salad for dinner, and went out to the garden to pick lettuce. What should I come upon but a dead possum. A BIG one. GACK. It says something that neither of the dogs ate it--it probably smelled too bad. I reasoned that they must have killed it in the morning (since it wasn't there the night before and I let them out around dawn) and it had been laying there in the rain, just waiting to be disposed of. I went to get a trash bag. Easy, right? Turn the bag inside out, pick it up by its tail, reverse bag, tie bag, end of story. OR NOT. Here's this smelly dead thing, and to top it off, it's WET. I'm not going to kid you folks, the smell would gag a goat. Still, I figured that if MY dogs had killed it, it was MY responsibility to take care of it. Scott had already had a rough day and probably didn't need to deal with dead animals on top of it. I reached down and grabbed the tail. Brace yourself. The outer layer of skin on the tail sloughed off. I know, that doesn't sound like a big deal, but what it meant was that the dead hunk of nastiness landed in a boneless pile even nearer to my feet with a kind of squishy thud and left me with a handful of skoodge (my term for a lump of skin and hairs) in the bag I was holding. I had to go retch in the rosebushes. The smell got even MORE overpowering. The dogs, being intelligent, were watching me from opposite corners of the yard--as far away from the stench as they could get. OK, next try was a shovel. For those of you who have never tried to pick up a limp, dead animal in the rain with a shovel while trying not to breathe AND place said animal into a trash bag that seems determined to evade your every attempt, go ahead and laugh. Someday you'll get to do it too. Then I'll get to laugh. Finally, I managed to maneuver the shovel properly over the bag and dump the noxious cargo. I had to go retch in the rosebushes again and get some fresh air. Then, holding my breath, I got the bag tied shut. Dang, it was full of air. What if Scott comes home, sees this in the Dumpster, and tries to pop it? AAAAACK. I did manage to warn him, and thank GOD he didn't pop the bag. 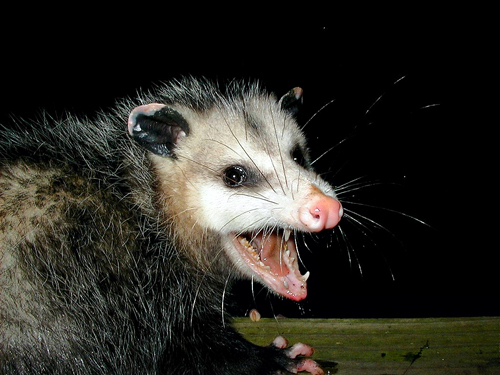 I had a serious twitch every time anyone said the word "possum" for weeks after that. I know that some people eat possum. Even Scott joked with Barb that he knew we were having soup tonight but he didn't know what kind. Ha. Ha. I've eaten some strange stuff. I like squirrel, I like alligator. I even like mountain oysters if they're made right. Barbacoa (meat scrapings off of a cow skull) is delicious. Cabrito (roasted baby goat) is delectable. Heck, I'm even getting myself prepared to slaughter my own chickens. But you know what, folks? I'd have to be starving before I ate possum. Just thinking about it . . .where's that rosebush? I think I need to retch in it. Have a good (possum-free) night! oh my! well i've been a Mama opossum a time or two or three! the one long term relationship was with a tiny little thing i named blossom, the opossum, who lived in a 5 gallon bucket for about 2 weeks. good on you! I love animals (and I've even had a ferret--they stink too but make great pets!) but I just don't think I could keep a possum!